Journal – Abandoned no. Interesting yes. Does that make you want to bookmark this site or what! No, of course not. You probably hadn’t considered the possibility that I’d abandoned this site until you saw me deny it. If I really want a slogan for this site, I should either completely ignore the topic of how often it’s updated, or better yet, I should brazenly advertise the fresh relevant content. After World War 2, pressure cookers were an increasingly popular way to cook. They cooked faster than traditional methods by applying high amounts of pressure as well as heat to foods. There was a problem though… sometimes a poorly-attended pot would explode, presenting a hazard to anyone nearby. Concerned manufacturers built in pressure release valves to solve this problem, and happily advertised their “new and improved” design. They figured that it’s only logical that people would want to buy the safer design, and looked forward to increased sales. I guess “less likely to explode” wasn’t the best marketing angle. Our children’s dentist warns parents to shut up about the dentist before bringing them for their first visit. Parents tend to say “don’t worry; it won’t hurt.” Naturally this has the opposite of the intended effect. We reveal by our denial that it’s something we’re worried about. And they should worry too. I like reading Daniel Pinkwater’s Ice-cream Larry to the kids. The polar bear (Larry) becomes the spokesbear of an ice cream company. His slogan: “I do not feel sick.” I always laugh when I think of that slogan. It’s funny for the adults reading the book because it’s so obviously a bad marketing statement. 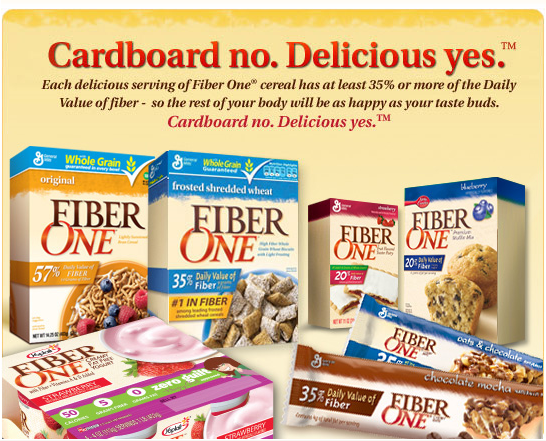 I liked Fiber One before they started printing this on the back of my cereal box. Now all I can think about is whether it does, in fact, taste like cardboard. I think they’re right: it doesn’t. Now pass the frosted flakes. August 11, 2009 2 Comments. This morning I pecked on your icon and found a morsel – that random peck was rewarded – I think that I will try again before another 2 months go by. And then I pecked on one of your links and found an earlier article that I missed. Quite a feast here this morning. October 1st, 2009 at 7:06 am. Permalink. Panhandler: Could I talk to you for a minute? It’s alright, I’m not violent, I’m not violent! January 23rd, 2010 at 6:53 pm. Permalink.